Manitoba Premier Brian Pallister is asking his colleagues to eliminate restrictions on interprovincial booze runs. Manitoba Premier Brian Pallister is asking his colleagues to eliminate restrictions on cross-border booze runs. In advance of next week's premiers meeting in New Brunswick, Pallister has written a letter to other provincial leaders outlining his priorities. He says the idea has broad public support, and would show progress in the effort to reduce interprovincial barriers on other items. The high court said provinces have the power to enact laws that restrict commerce if there is another overriding purpose, which in New Brunswick's case was the desire to control the supply of alcohol within the province. Pallister's letter says the premiers should adopt a recommendation to reduce alcohol restrictions from an advisory body called the Regulatory Reconciliation and Co-operation table, set up under the Canada Free Trade Agreement. 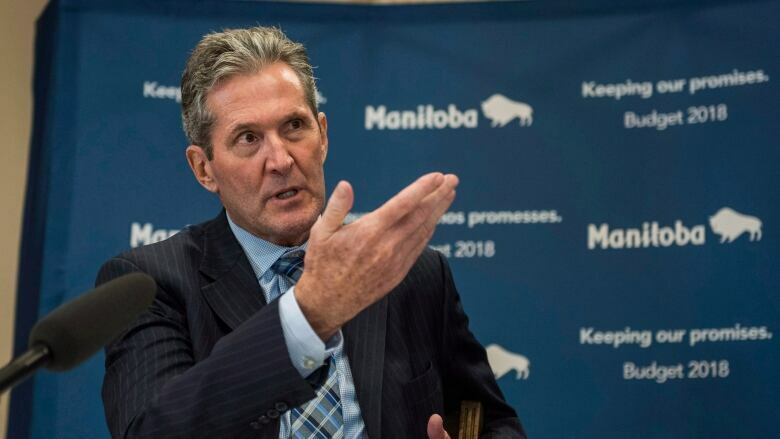 "In particular, the recommendation regarding a personal use exemption will address long-standing concerns regarding the transportation of alcoholic beverages across domestic borders by significantly increasing personal-use limits," Pallister wrote. "I suggest we consider going further by fully removing those limits, a move strongly supported by Canadians from every region of the country." "The Bank of Canada has estimated that removing existing trade barriers could raise real GDP by the equivalent of approximately $1,500 per family per year. Viewed from that perspective, the costs of inaction are high." Alberta's Rachel Notley wants to find some replacement for Greyhound bus routes that are being ended across Western Canada at the end of October. "I will be raising this issue at the Council of the Federation with a view to working on common solutions with my fellow premiers and the federal government to ensure western Canadians — particularly those living in rural areas, including many Indigenous communities — have access to the transportation services they deserve," Notley said in a written statement Wednesday. "The companies that take the subsidies tend to run out as soon as the subsidy runs out." An earlier version of this story said the Bank of Canada has estimated that removing existing trade barriers could raise real GDP by the equivalent of approximately $1,500 per year. In fact, that figure is per family per year.